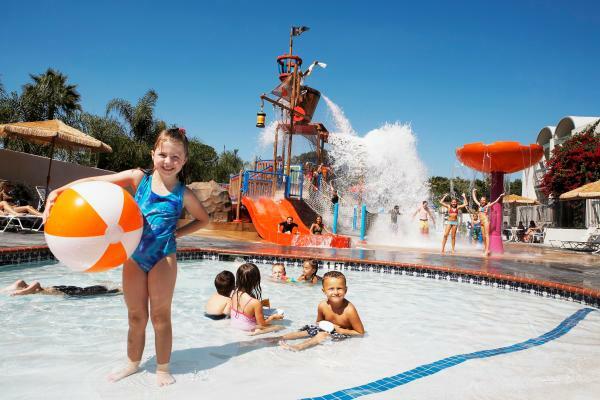 MouseSavers readers save 15% off best nightly rates at the Howard Johnson Anaheim Hotel and Water Playground! And this rate is fully changeable and can be cancelled up to 48 hours prior to your stay! See below for details. Howard Johnson Anaheim Hotel and Water Playground in Anaheim, across the street from Disneyland, consistently shows up as a fan favorite on every survey or website we’ve ever seen. 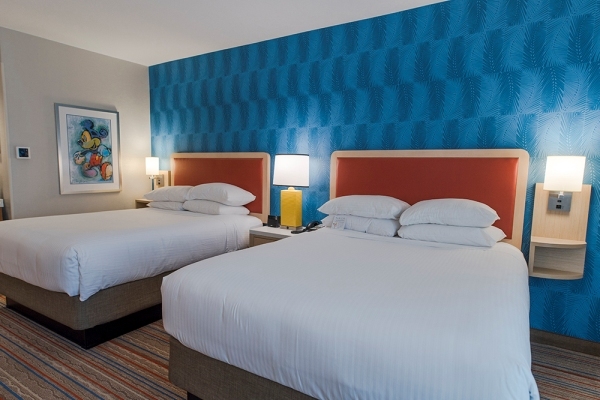 The accolades are deserved, because this hotel offers great value, lots of family-friendly amenities, and has a terrific location within easy walking distance of Disneyland and Disney’s California Adventure. Designed by world-renowned architect William L. Pereira (who also designed the famous Transamerica Pyramid in San Francisco and the “space age” Theme building at LAX), this particular hotel is probably the nicest in the entire Howard Johnson chain and it’s mid-century design is unusually interesting. Even though its design dates back to the 1960s, Howard Johnson Anaheim Hotel and Water Playground is well-maintained and is continuously updated to keep things fresh. 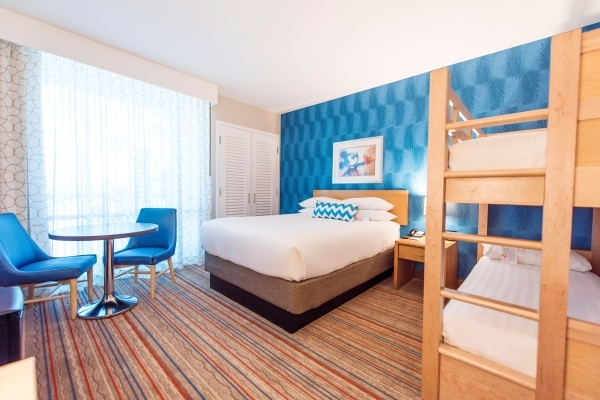 The 296-room HoJo Anaheim is currently undergoing a $12 million renovation, completely updating its standard rooms with contemporary retro-inspired decor including new furniture, soothing resort blue wall coverings and vintage Disney themed art. HoJo’s Building 1 Tower has been completed and renovation of all other standard rooms across the property is expected to be completed in 2019. Rooms not yet renovated are very well maintained, and are nicely decorated in golden tones, with oak-colored furnishings. 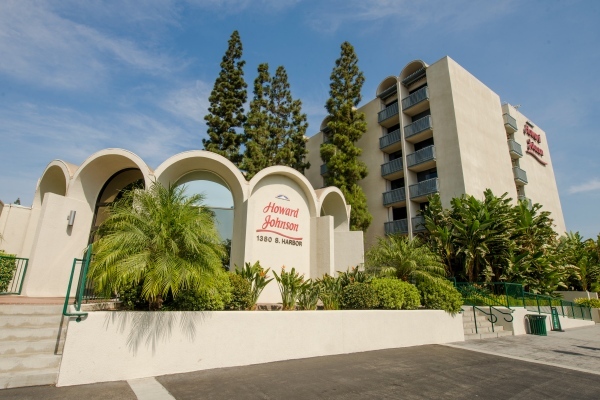 Howard Johnson Anaheim’s generously-sized guest rooms are spread over several buildings, all of which are located on a pleasant and attractively landscaped 7-acre property, giving it a feeling of spaciousness that you won’t find at most of the other hotels along Harbor Boulevard. And all of the rooms are accessed by interior corridors– unlike most of the accommodations within walking distance of Disneyland. This is advantageous both in terms of safety and noise reduction. Many rooms will give you at least a glimpse of the Monorail, and some rooms on the top floor of certain buildings offer views of the fireworks and the Matterhorn; there is an extra charge for these rooms. Standard rooms are equipped with two double beds, two queen beds or a King bed, or you can request a family suite with 1 queen bed and junior bunk beds. All rooms include a small refrigerator, a microwave oven, coffeemaker, hairdryer, iron and ironing board. Most rooms have double sinks and large balconies. All rooms have a flatscreen LCD television with expanded channel selections, including Netflix and Hulu –so you can keep watching your favorite show or have a movie night right in your room! And another value feature: all rooms at the Howard Johnson have FREE Wi-Fi Internet access! There is also a video game room for kids with a variety of arcade games. The hotel does not have a restaurant or room service, however you can just stroll about 100 feet from the Howard Johnson’s lobby to Mimi’s Cafe, a terrific, value-priced restaurant that serves breakfast, lunch and dinner. 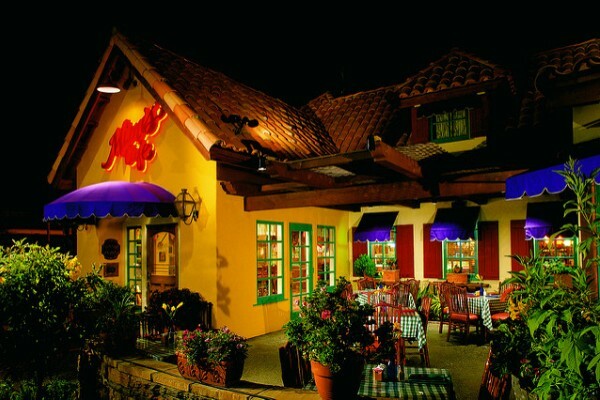 Mimi’s is a regional chain and we’ve eaten there many times. Each room at this restaurant has a slightly different theme, and the food is excellent. If you get tired of Mimi’s — which will be difficult, because it has a huge menu — you’re only about a 3- to 5-minute walk from other dining options, including McDonald’s, Denny’s, Panera Bread, and IHOP. If you want to stock up your in-room fridge with some quick snacks or cold breakfast items, you can pick those up in the hotel’s Main Street Market convenience store, which charges reasonable prices for items like milk, cereal and bread. The fridge and microwave in your room are very handy if you just want to feed the kids some Cheerios or oatmeal before you head off to Disneyland. Main Street Market also sells a variety of Disney theme park tickets and souvenirs. It is an easy 7 – 10 minute walk from Howard Johnson to the main gate into the theme parks. That’s about the same distance from the furthest tower of the Disneyland Hotel to Disneyland’s main entrance plaza! If you prefer not to walk, the hotel participates in the Anaheim Resort Transportation system, which will take you to and from the Disney parks all day for a small fee. The hotel doesn’t add on any “resort fees” or “energy fees, and if you’re bringing a car, parking is FREE! We have enjoyed several stays at Howard Johnson Anaheim Hotel and Water Playground. My wife and I took our 3 year old to Disneyland and tried your tip on staying at Howard Johnson’s – what a great savings and a nice place to stay! We appreciate your tip. One suggestion – if traveling with a toddler that you would like to have nap in the afternoon, request a ground floor room. The upper rooms have attractive arch windows on the front and back of the room with no curtains – so sunlight comes in and doesn’t allow for the room to get dark in the afternoons. Otherwise, I would give our stay at Howard Johnson’s a HUGE thumbs up! We’ll be going back! 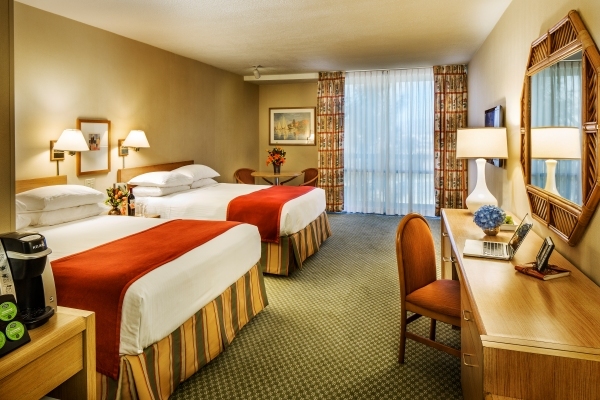 MouseSavers.com Readers Get Special Discounted Rates at Howard Johnson Anaheim! Save 15% every day off nightly rates! This rate is fully changeable and can be cancelled up to 48 hours prior to your stay. Note: In order to receive MouseSavers special discounted rates, you must sign up for Wyndham Rewards. It’s easy and free, and you can cancel anytime after you check-out. If you book your stay and do not sign up, you will need to enroll at check-in in order to receive MouseSavers discounted rates. Enter Promo Code LKMS to see MouseSavers rates. Take advantage of great MouseSavers.com rates at Howard Johnson Anaheim Hotel and Water Playground! Enter Promo Code LKMS to see MouseSavers rates! Not able to book the dates you want online? There is occasionally an issue with the online booking system. Call the hotel directly at (800) 422-4228 and ask for the MouseSavers rates.